As you all know, we’ve been on the tempered glass screen protector bandwagon for some time now. We have done our best to bring you all of the best in tempered glass for all of the top devices over the last year, to help you decide if spending this kind of money on screen protection is worth it. One of our long-standing favorites has been the GLASt from Spigen because not only does it provide great protection, but Spigen tends to toss in extra goodies like screen wipes, back protectors, squeegees, button covers, etc. So when we heard about their new GLASt.R, a thinner, lighter, and rounded tempered glass protector, we had no choice but to take a look. Like with other tempered glass protectors for mobile devices, the new GLASt.R sports an 8-9H hardness for protection along with an oleophobic coating to help reduce smudges and fingerprints. Where it differs, is in the new rounded edges that should help reduce chipping, but also provide an incredibly smooth feel while using. Spigen is claiming that this new GLASt.R is 28% slimmer and lighter than its predecessor as well. I can tell you that after using it for the last couple of hours that I’m incredibly impressed by it. 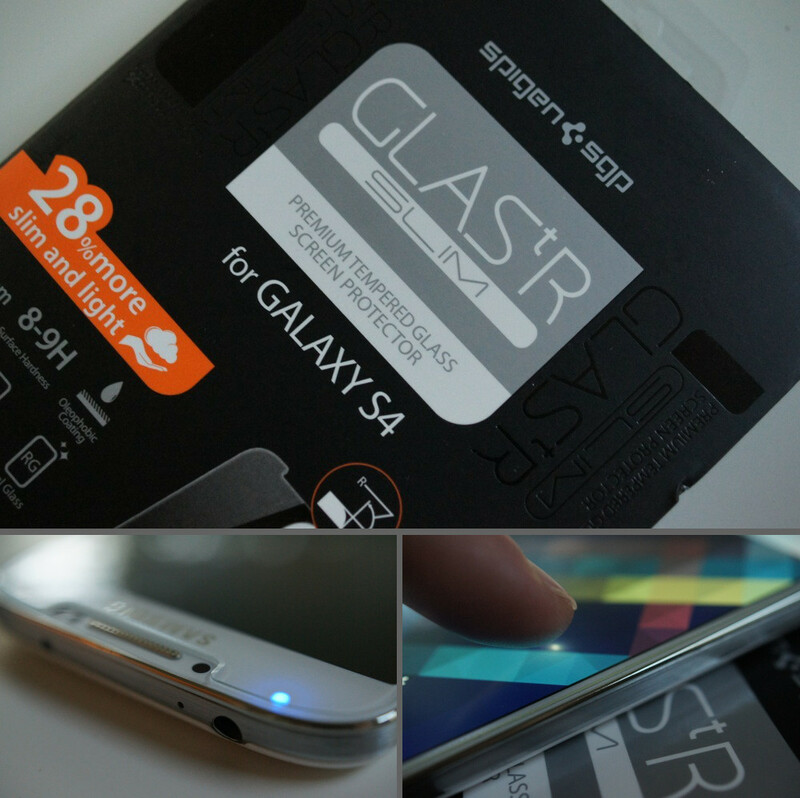 Tempered glass screen protectors have been pretty hit or miss in the past, but this one seems to be nothing but a hit. The rounded edges feel incredible. There seems to be almost no gap between the protector and the display, making it feel as if it’s one and the same, while protectors in the past left you with a disconnect. The sensitivity you would see with your device’s actual display is there, plus all of the gestures and Air View technology still works. There is no dotted grid or pattern on the protector either, which is another issue we have seen with similar products in the past. The only downside I can see so far, comes during installation. If you get anything on the sticky side of the GLASt.R, it’ll essentially ruin it. Attempting to clean the backside after it has been tainted is almost impossible. So be sure you are in a completely dust-free and sterile environment before you get to applying. Should you get it on there cleanly the first time, keep it there. At $35, it’s not cheap, but that price matches up to others in this arena. Keep in mind that the regular GLASt is $28, so there is a cheaper option. I’d recommend this one, though, as it feels that good. To see it in action, check out the clip below.